The patient is a middle-aged female who presented to Weill Cornell Medicine in the Spring of 2016, whereby at that point in time she had no past medical history and presented with a facial rash consistent with petaloid seborrheic dermatitis. She also had papules and plaques on the neck and chest. I had rendered a diagnosis at that point of primary cutaneous smoldering adult T-cell leukemia lymphoma based on the biopsy performed. She was discovered to have HTLV1 positivity in her skin specimen as well as her peripheral blood. 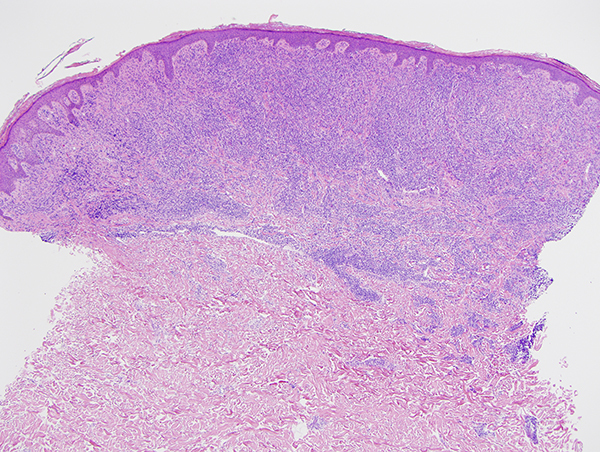 At the time of the initial presentation in 2016, the biopsy showed a psoriasiform dermatitis with epidermotropism of the atypical lymphocytes along with a superficial lymphomatoid vascular reaction. 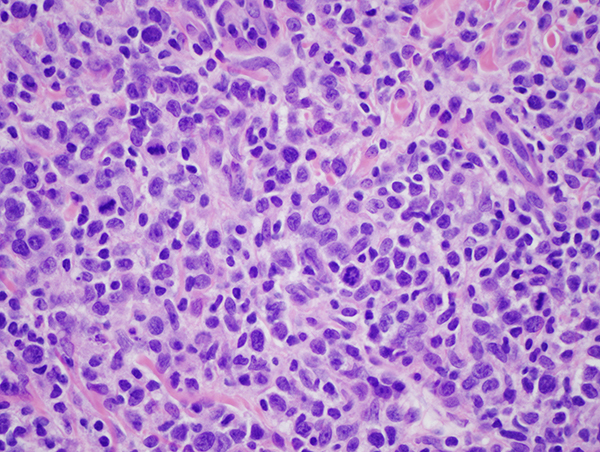 It was really not lymphomatous at that point in time, but more in the context of a psoriasiform epidermotropic pattern that one associates with chronic smoldering adult T-cell leukemia lymphoma. 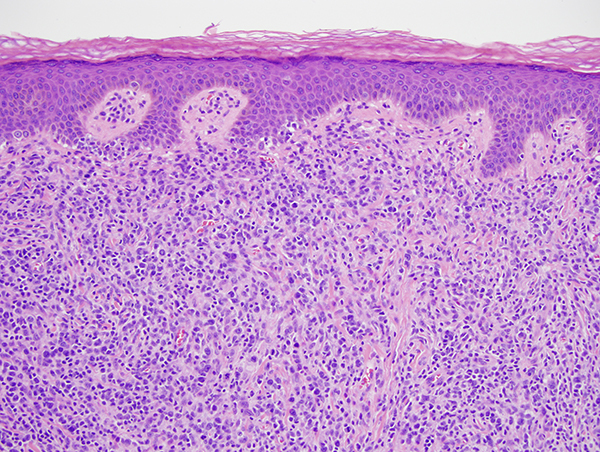 The current biopsy shows that there is clear cut morphologic progression to a lymphomatous pattern with a striking tumefactive effacing growth of malignant lymphocytes in the superficial dermis predominated by large transformed CD30 negative malignant T-cells.